03 JanWhat is the correct left hand position on guitar? 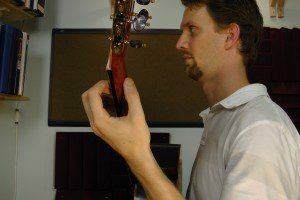 Technique is an important part of playing any instrument. (See the post on technique for a fuller description.) Today, I would like to talk about the correct left hand position on guitar. For the best right hand position, see here. While the exact positioning of each players hand might vary slightly because each player and each instrument are slightly different in size, the proper left hand position will follow the four rules of efficient musculoskeletal function. It is important to have a qualified teacher to help you with these fine details of positioning. 1. The left wrist should be kept straight. It should have minimal deviation and arch, none if possible. It should have no more than 10 degrees of arch, 20 degrees at the absolute maximum. In other words, it should be relatively straight. Below are examples of poor positioning, followed by good positioning. This satisfies the requirement of muscular alignment. Poor positioning – Left wrist is arched (overly flexed) and deviated (to the ulnar side). Poor positioning – Arched wrist from excessive wrist extension. Proper positioning – left hand is free of deviation. Good positioning – left wrist is free of arch. No wrist flexion or extension. The finger’s base knuckles are in front of the fretboard, in other words, opposite the player from the fretboard. 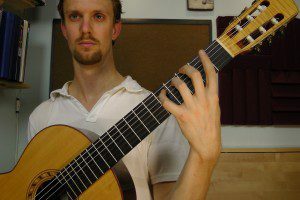 The thumb is open, relaxed, and to the left of the fingers. 2. The left hand fingers should be positioned so that all of the joints in the fingers are curved and in the middle of their range of motion. This satisfies the requirement of midrange function of joints. Below are images of both good and poor finger position. 3. The left hand twist (wrist rotation) is set so that the pinky side is slightly closer than the index side. 4. 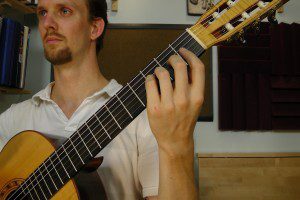 The large base knuckles of the finger are positioned on the side of the fretboard opposite the player. 5. The left hand thumb should be open and relaxed. It should not come over the top of the guitar’s neck, and it should not behind the fingers. Instead it should be slightly to the left of the fingers. Good Positioning – the left hand fingers are naturally curved and position in the middle of their range of motion. 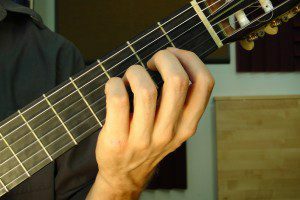 The wrist is turned so that the pinky side of the hand (ulnar side) is slightly closer to the fretboard than the index side (radial side). describe the optimal left hand position. Because of the demands of left hand playing, it is not always possible to stay in this position. The player may leave this position to make a stretch or play a difficult chord or barre, but the player should return to this optimal position as soon as is possible. Because of all the many variables in playing the guitar, consider taking some guitar lessons with a qualified teacher to help you get set up in the perfect left hand position. I just wanted to find out your thoughts regarding using a guitar stool to improve holding the guitar as well as the fretting hand? Wonderful! What other topics would you find helpful? Perfect post and photos! This is a very hard concept to teach. I'm glad it was helpful! Are your students exclusively classical students, or do you have acoustic/electric too? I find it easier to help students achieve this position on the classical guitar than the other two - but I think that is more a problem of posture and positioning.